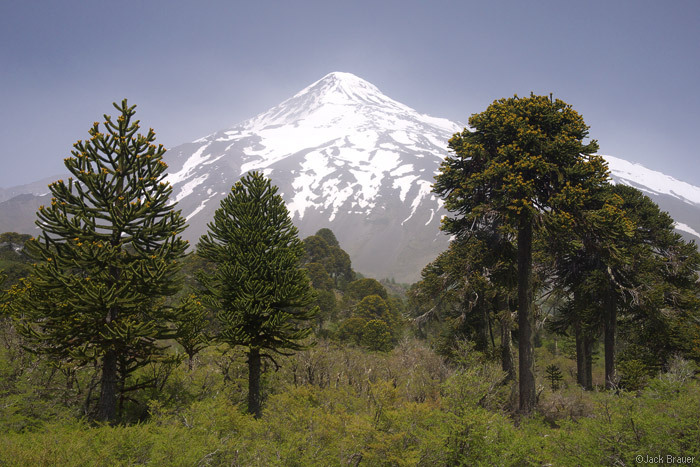 Last week we left Pucón and took the bus over the Andes and over the border into Argentina. Our destination: the famous Lakes District town of Bariloche. We had known that the area around Bariloche had been negatively affected by ash from the June eruption of the Puyehue volcano in Chile (check out that link – amazing images!). And we knew that the volcano was still spewing ashes nearly six months later; in fact I took the above shot of Puyehue from the summit of Volcan Villarrica last week. But I guess I had hoped that the conditions would be back to normal in Bariloche and that we could do some nice trekking in the mountains there. Well, I definitely underestimated the menace of Puyehue! The ashes spewing out of Puyehue get blown wherever the wind blows, which is usually due east, straight into Argentina. Villa La Angostura, a town north of Bariloche, received the brunt of Puyehue’s initial eruption in June; as we drove through in the bus we were shocked to see the entire forest covered in what looked like 6 inches of gray cement. Things weren’t as bad in Bariloche, but during our few days there the area was blanketed off and on in a haze of ash, sometimes so thick that it looked like fog. To make matters worse, public transport to the mountains was severely limited due to the lack of tourists this year (due to the ash). Though we had been excited to trek in the incredible mountains, we decided to leave Bariloche. I do know that I will be back in the future; in fact after getting a glimpse of the mountains and learning about the immense trekking possibilities, Bariloche is higher on my travel wish list than ever before. But for now, we felt that it wasn’t meant to be. The silver lining of the ill-fated detour to Bariloche was the opportunity to meet up with Nicolas Belokurov, Patagonian photographer extraordinaire and Bariloche trekking expert. Thanks, Nicolas! 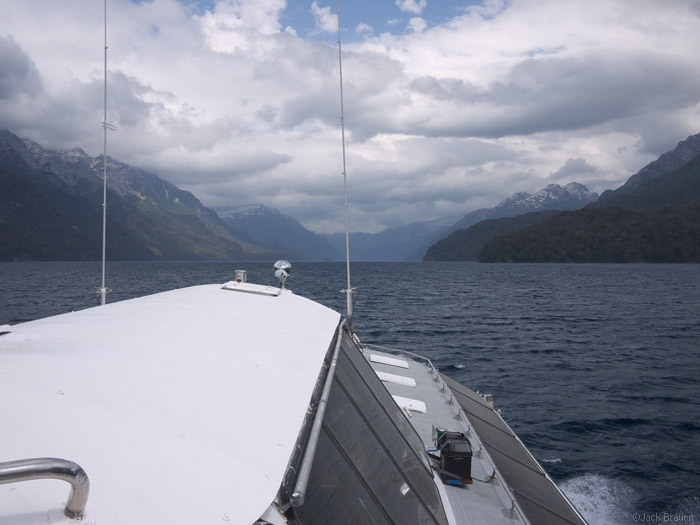 Our route back to Chile was the famous (and dreadfully expensive) Cruce de Lagos, a series of boat and bus shuttles across three large lakes. This must be one of the most scenic and spectacular border crossing routes in the world; unfortunately the ever-cloudier weather prevented us from seeing most of it! Nevertheless, the temperate jungle around the lakes is amazing. 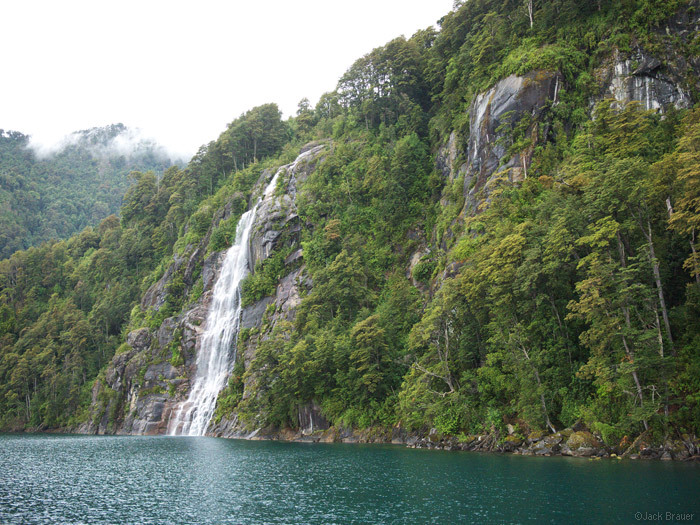 Here’s one of many waterfalls crashing into the emerald colored Lago Todos los Santos. The area reminds me of Fiordland in New Zealand. Now we’re in the small lakeside town of Puerto Varas, where we are waiting day after day for the rainy weather to clear up a bit so that we can go on a week-long backpacking trip into a spectacular valley near here. It was a downer to escape from the ash into the rain, and I must admit that I was a bit of an agitated and grumpy traveler for our first day here. But, luckily for Claudia, I’ve mellowed out and am fully adjusted to our lazy, do-nothing days while we’re stuck here. Hopefully before too long the sun will come out, our trip will kick back into gear, and my next post will have some stunning mountains to share! <hey Jack, its <david. my friend and i are in buenos aires presently, leaving tomorrow morning for el calafate and immediately for <el chalten (tuesday). we will be in <el chalten thru the weekend and plan to be in Torres del Paine by this Sunday. Where are you now, and where will you be this weekend? lets try and get together at some point…let me know what your up to. Hey David, check your email!